One of the tasks that you will have to take care of, as a homeowner, is finding the right Lake Norman window blinds and shutter company to work with if you plan on getting quality window treatments that will last. Locals here know that the name to count on is Sweet Shutters and Shades. With over 20 years of experience behind our company founder, you can rest assured that we take this line of work seriously, as well as take great pride in all that we do. Choosing the right window coverings for your home doesn't have to be a complex task. The key to success is finding a reputable expert to work with, which is why so many locals trust in us. We genuinely care about the clients we work with and our ability to provide excellence in all that we do. From the initial consultation to the products we work with to the expert level installation, every aspect of the job matters. We are more than just a team of window blind salespeople; we are skilled experts dedicated to customer satisfaction through customization of quality window treatments in Lake Norman. There is a big difference between the two, so let us show you in person what that difference looks like. For one thing, shutters look ideal for every type of design preference; from classic to modern and everything in between. This is especially important since your window treatments are visible from both inside and out, impacting both the interior design aesthetics and the curb appeal. This is an excellent choice, if privacy and light control are important to you. No other window treatment offers the same amount of flexibility or control, in this department. 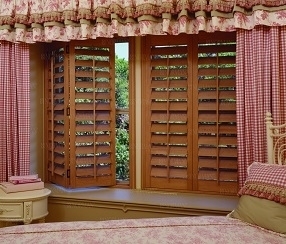 Shutters are also ideal for improving thermal insulation. Not allowing the sun rays through in the summer and not allowing cool air from the window through during the winter are two examples of this. You can feel good knowing that this will keep your utility bills lower and make your house more eco-friendly. Another option for you to contemplate would be window blinds in Lake Norman, NC. This is a look that works well for residential or commercial structures, especially office buildings. Blinds are a cost-effective solution and one that could work in your home or business. Get in touch with the team here at Sweet Shutters and Shades to get the final results that you really want. If you are looking for an experienced Lake Norman shutters or window blinds professional then please call 704-980-4303 or complete our online request form.